If you’ve ever had chickenpox — and almost all of us have — there’s a good chance that the causative varicella zoster virus is still in your body. The virus does not get eliminated even after your chickenpox has resolved. It can lie dormant for decades in your nerve cells without causing any symptoms. In some people, this virus wakes up or reactivates later in life, often many years after the initial infection and travels along the nerve fibers to the skin. How the virus remains in the body or subsequently re-activates, is still not well understood. The result is a distinctive, painful rash with blisters called shingles, herpes zoster or simply herpes. Typically the rash appears in a band, a strip, or a small area always on one side of the face or body, hence the name “shingles” (from the Latin word for a belt or girdle) or “zoster” (a belt in Greek). 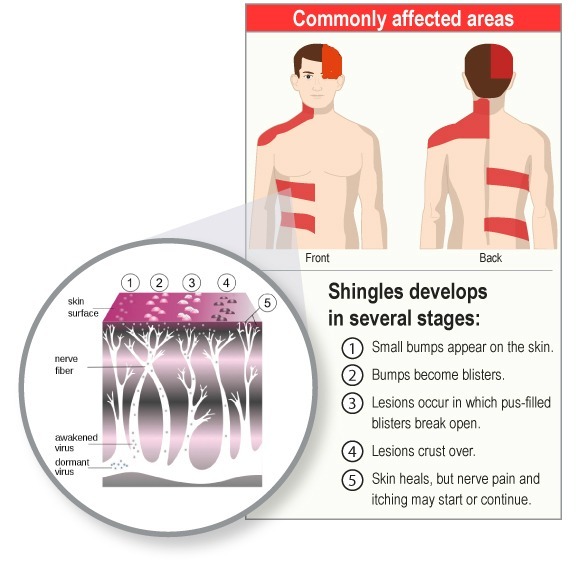 Shingles rash travels in the distribution area of the skin (dermatome) supplied by a nerve and can wrap around either the left or right side of your body but never crosses the mid-line. Shingles is most common in older adults and people who have weak immune systems because of some disease, stress, injury, certain medicines… or those who’ve had chickenpox before 18 months of age. It develops in stages. Two to four days before the rash occurs there may be itching, tingling, numbness or local pain in the area. You might experience flu-like symptoms (usually without a fever) such as headache, chills, stomachache, or diarrhea, just before or along with the start of the rash. Swelling and tenderness of your lymph nodes may occur. The rash starts as a band or patch of raised dots/spots on one side of the body. The rash caused by shingles is more painful than itchy; emphasizing that although the obvious signs are in the skin, the actual disease process is within the nerves. Sufferers describe the pain as excruciating, sharp, stabbing, burning, piercing, throbbing or a combination of all of these! Pain can be extreme as the rash reaches its height. The spots enlarge and turn into fluid-filled blisters, clear at first but may become cloudy after 3 to 4 days. These blisters break open, ooze, only to dry out and crust over in about 5 days. Once dry, they no longer contain the virus and are not infectious. 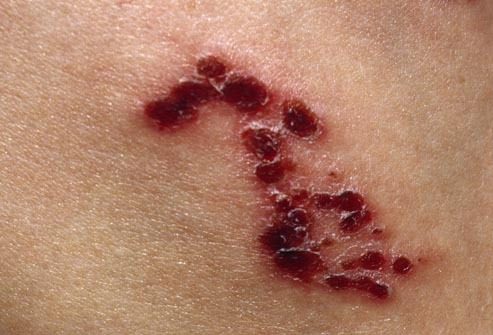 The rash usually heals within two to four weeks, although some scars may remain. It is possible to have more than one area of rash on your body. 20 percent of those who have an attack of shingles find themselves left with a persistent nerve pain after the rash has gone and the skin is intact again… as a complication. The pain termed post-herpetic neuralgia (PHN), can last for several months or years. This pain may make it difficult for the person to eat, sleep, and do daily chores. It may also lead to depression. 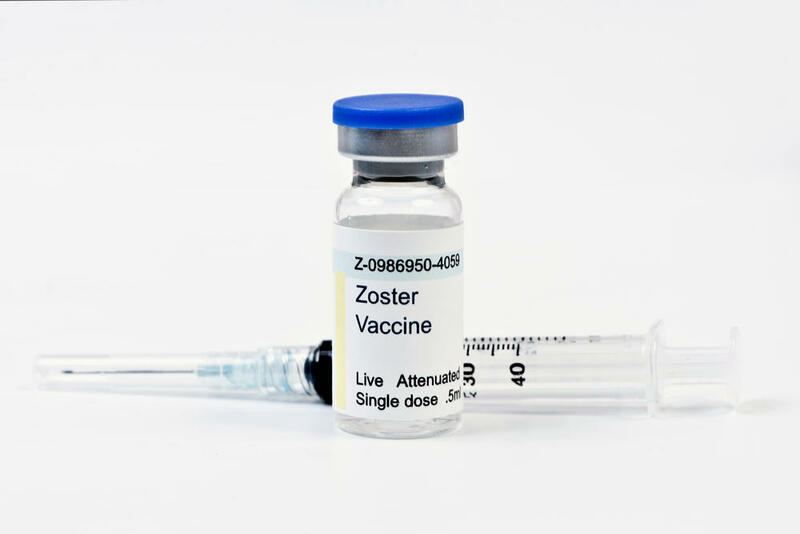 In those with poor immune function the rash may occur widely over a large portion of the body – Disseminated zoster. Herpes zoster ophthalmicus is a rash on the forehead, cheek, nose, and around one eye, which could threaten your sight. You should seek prompt treatment from an ophthalmologist for this condition. In shingles, though skin is the most frequently damaged tissue and sensory nerves are the most commonly involved, motor nerves (responsible for movement) can be affected too, especially in the face causing one-sided drooping. It may affect other organs – the heart, lungs, liver, pancreas, joints, and intestinal tract. If shingles virus affect the nerves originating in the brain (cranial nerves), serious complications involving the face, eyes, nose, and brain can occur. Yes, but not in the way you may think. People who’ve never had chickenpox, or the vaccine to prevent it, can pick up the virus by direct contact with the open sores of shingles. Keep a shingles rash covered and avoid contact with infants, as well as pregnant women who have never had chickenpox or the varicella vaccine. Exposure to the virus in the shingles blisters can cause chickenpox in someone who has not had it before. Virus in a Shingles blister will not trigger shingles. Treatment depends on the nature and location of the illness. This includes antiviral medicines like acyclovir, medicine for pain such as acetaminophen or ibuprofen, and topical antibiotics applied directly to the skin, to stop infection of the blisters. Starting your medicine right away can help your rash heal faster and be less painful. If you are bothered by PHN pain, tell your doctor. You may need antidepressants, anticonvulsants, or opioids to help relieve this pain and topical anesthetics like benzocaine to relieve long-term pain. Lidocaine patches for pain, such as Lidoderm, are also available but only by prescription. Shingles is most common in people 50 or older, those who have medical conditions that keep the immune system from working properly, or people who take medicines that suppress the immune system. The CDC recommends it for everyone 60 and older who doesn’t have a medical reason to skip it, but it’s approved for people as young as 50. Shingles vaccine contains a weakened chickenpox virus. The vaccine shot can roughly cut in half your chances of getting shingles. If you’ve already had shingles, the vaccine may help prevent it from coming back. Some people who get the vaccine still get shingles. But they’re more likely to have shorter periods of shingles-related nerve pain – post herpetic neuralgia, which is very painful and can last weeks, months, or even years after the rash goes away. Do I Still Need the Vaccine if I’ve Had Chickenpox in the Past? Yes. The virus stays inactive in your body long after you’ve had chickenpox and can flare up as shingles. You might notice some redness, soreness, swelling, or itching on the back of your arm where you get the shot. Less common side effects include headaches. Can I Get the Shingles Vaccine if I’m Younger Than 50? This vaccine is approved for people 50 and older. Some doctors may give it to younger people in hopes that it will give them earlier protection against shingles. But it’s not clear how long your immunity would last. Homoeopathy has something to offer in shingles at every stage. Before the rash has appeared, when there is just some tingling, and it is suspected, taking some Aconite (homoeopathic medicine) can do wonders. Aconite is helpful in the first stages of many acute illnesses as it cuts down their duration. Once the rash starts appearing, other remedies come into play. The major remedy being Rhus toxicodendron (poison ivy). The use of Rhus tox in shingles is a very obvious and useful example of the similia principle of homoeopathy. The rash caused by a poison ivy plant brushing against the skin resembles shingles quite remarkably. There is inflammation, intense blistering and intolerable itching of the skin which continues for several days before healing and resolving. If the patient is very chilly with restlessness, anxiety, exhaustion and a worsening of symptoms between midnight and 2 am, then Arsenicum album is likely to help. Arsenicum, of course, has a major keynote with burning pains apparently paradoxically relieved by warmth. Mezereum (spurge olive) is useful for rashes which are very painful and intensely itchy, especially on the scalp and particularly in older people. The blisters may burst to form brown scabs. For a rash that is described as feel­ing like a burn, Cantharis (Spanish fly) is a good choice. Ranunculus bulbosus (buttercup) is often indicated with severe nerve pains, when the slightest touch or movement makes the pain worse. It is also partic­ularly helpful for rashes on the left chest wall which are slightly bluish in colour. Iris versicolor (blue-flag) is most applicable to right–sided rashes. It is also used a lot for migraineous headaches with a lot of burning in the stomach and vomiting. Other remedies for shingles include Lachesis, Petroleum, Causticum and Mercury. Another approach would concen­trate on events in life before the attack and whether there was anything particular which might have triggered it. Administering a grief remedy like Ignatia for shingles coming on in close proximity to a bereavement, or an injury remedy like Arnica if it came on soon after an accident. Homoeopathy gives wonderful results in post-herpetic neuralgia (PHN), the most distressing of the occurrence. In addition to the remedies mentioned above, Spigelia acts wonders in shooting pains along nerves. Variolinum, the nosode made by potentizing fluid from the skin lesions of smallpox, taken as a single dose before other remedies, cuts down the suffering associated with shingles and is especially useful in PHN. Topical application of Rhus tox cream is very helpful early in the bout in cutting down the spread of blisters and in the pain of PHN, though great care and attention towards cleanliness needs to be taken if the skin is very broken. Hypercal (Hypericum and Calendula) solution are pain relieving too. Anything that might reduce the suffering associated with shingles is a welcome. Try Homoeopathy!